This mix of tomatoes and bacon tossed with arugula and our special ravioli brings a delightful taste of the Old World into your busy one. Heat dressing in large skillet on medium-high heat. Add tomatoes and onions; cook and stir 5 to 6 min. or until onions are tender. Stir in bacon and broth; cook 2 min. or until sauce comes to boil. Add hot cooked Italiano Ravioli and arugula; toss to coat. 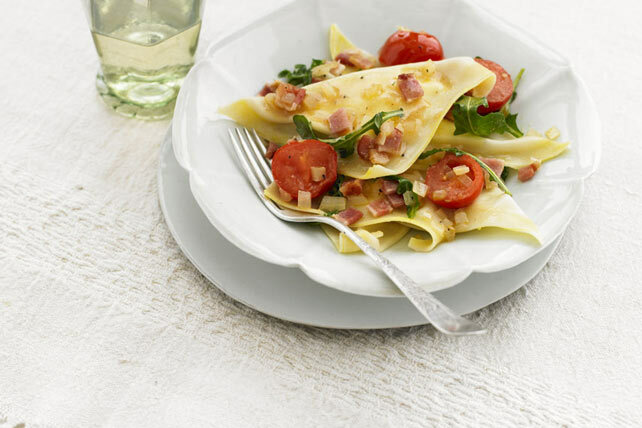 Save time by preparing with frozen cheese-filled ravioli, cooked as directed on package.